CULVER CITY, Calif. (Jan. 26, 2014) – The compelling and critically acclaimed drama Whiplash arrives on Blu-ray™, DVD and Digital HD Feb. 24 from Sony Pictures Home Entertainment. Inspired by writer/director Damien Chazelle, this Sony Pictures Classics film follows the journey of a young jazz musician with a passion for drumming and dreams of greatness. Andrew Neiman, played by rising star Miles Teller (That Awkward Moment), is a determined 19-year-old student. His rigid music teacher, Terence Fletcher, played by J.K. Simmons (Golden Globe® winner and Oscar® nominee for his role), sees Andrew's raw talent, but will accept nothing less than perfection. Nominated for five Academy Awards® (Best Picture, Best Supporting Actor, Adapted Screenplay, Editing, Sound Mixing), Whiplash also stars Paul Reiser (Life After Beth) as Andrew's father and Melissa Benoist ("Glee") as Andrew's love interest, Nicole. Winner of both the Audience and Grand Jury Prizes at the 2014 Sundance Film Festival, Whiplash was first screened at the festival as a short film a year earlier to excellent reaction. Chazelle returned a year later with a full-length version, which captured the top prizes in Park City and continued on as a festival favorite throughout the year. Film critics took to the film immediately, as evidenced by a 95 percent rating on Rotten Tomatoes. Variety's Peter Debruge wrote that "[Whiplash ] demolishes the clichés of the musical-prodigy genre, investing the traditionally polite stages and rehearsal studios of a topnotch conservatory with all the psychological intensity of a battlefield or sports arena." In addition, Rolling Stone called the film "electrifying," and Peter Travers proclaimed that Whiplash is "A spellbinder. Miles Teller and J.K. Simmons will blow you away." 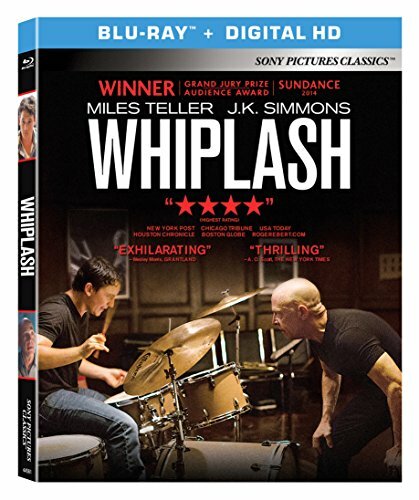 Whiplash bonus features include commentary with J.K. Simmons and Damien Chazelle and a Toronto International Film Festival Q&A with Miles Teller, J.K. Simmons and Damien Chazelle. Exclusive to the Blu-ray is the original short film the movie was based on and a deleted scene, both of which include optional commentary and a 42-minute documentary featuring famous drummers who share stories and discuss their passion for the craft including Chad Smith, Peter Erskine, Gina Schock, Doane Perry and many more. SYNOPSIS - Andrew Neiman (Miles Teller) is an ambitious young jazz drummer, single-minded in his pursuit to rise to the top of his elite east coast music conservatory. Plagued by the failed writing career of his father, Andrew hungers day and night to become one of the greats. Terence Fletcher (J.K. Simmons), an instructor equally known for his teaching talents as for his terrifying methods, leads the top jazz ensemble in the school. Fletcher discovers Andrew and transfers the aspiring drummer into his band, forever changing the young man's life. Andrew's passion to achieve perfection quickly spirals into obsession, as his ruthless teacher continues to push him to the brink of both his ability—and his sanity. WHIPLASH has a runtime of ~107 minutes. It is rated R for strong language, including some sexual references.